San Francisco, CA--Dan Dugan Sound Design has introduced the Model E-1A Automatic Mixing Controller. The new product builds on the architecture of the existing Model E-1, adding increased DSP power to provide up to 16 channels of Dugan’s transparent automatic mixing. 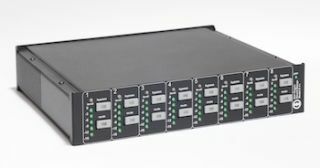 Now like Dugan’s larger D-series automixers, the new Model E-1A allows users to divide the Dugan unit into three separate automixers, with each set having its own set of master buttons on the software control panels. The Model E-1A replaces the Model E-1. Model E-1 owners having serial numbers 417 and above already have the hardware and will be able to update their units to all the new features via a firmware upgrade. The Model E-1A is Dugan’s economy model, “A Dugan for the rest of us,” said Dan Dugan. The Model E-1A includes the upgraded Dugan Control Panel for Java, a real-time remote control panel. A newly announced iPad app (purchased separately) brings touch control to the Dugan Control Panel. In addition to eight channels of analog I/O, the Model E-1A has two pairs of ADAT connectors. One pair may be used for digital I/O with the second pair utilized for linking, or the link connectors may be repurposed for an additional eight audio channels. Dan Dugan Sound Design automatic mic mixing products eliminate cueing errors, reduce feedback and ambient noise pickup, allow for smooth transitions between talkers, provide consistent system gain no matter how many mics are open, have the ability to link up to eight units into one system, and can be remotely controlled.